RÜSSELSHEIM, Germany : June 30, 2009 - Green shoots continue to sprout on the Opel model line-up: Starting this fall, the especially environmentally friendly Insignia ecoFLEX will be available as a Sports Tourer. The elegant station wagon version of Europe’s 2009 Car of the Year sips in the combined cycle just 5.3 liters of diesel per 100 km and emits only 139 g CO2/km. (ecoFLEX sedan: 5.2 l/100 km, 136 g CO2/km). – while offering a load capacity of up to 1530 liters. 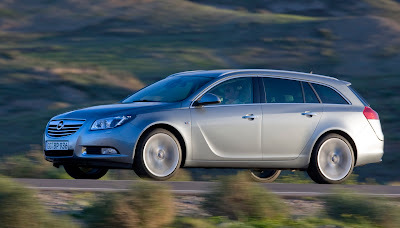 All Insignia ecoFLEX models combine economy with driving fun. The 2.0 CDTI engine with the Clean Tech System delivers 118 kW/160 hp and has maximum torque of 380 Nm. The Insignia ecoFLEX Sports Tourer accelerates to a top speed of 215 km/h – three km/h faster than the normal version – and sprints from zero to 100 km/h in 9.9 seconds. The Opel Insignia ecoFLEX Sports Tourer can be ordered now, with prices starting at 28,690 euros (RRP incl. VAT) in Germany. It comes with a six-speed manual transmission, a longer final drive ratio, a range of aerodynamic optimizations and specially developed, 225/55 R 17” low-resistance Michelin tires. “The Insignia ecoFLEX is more than just a green car. It offers the same package of high driving performance, innovative technologies and comfort as the other Insignia models. And for this price, it has no serious competition – this is true for both the Sports Tourer and the sedans,” says Hans Demant, Managing Director, Adam Opel GmbH. Just how parsimonious the new Opel Insignia ecoFLEX is, was highlighted at the sedans’ press launch in June. European journalists driving the Insignia ecoFLEX for two weeks in the region south of Frankfurt confirmed that the official factory figure of 5.2 liters of diesel per 100 km is very realistic. On the first part of the test circuit, consisting mainly of country roads from the Frankfurt Airport to Heidelberg, most of the cars needed less than five liters of diesel. Some of the journalists really concentrated on their gas pedal behavior; one reporter from Croatia hit a record of 3.6 liters per 100 kilometers. GAYDON : June 29, 2009 - Aston Martin has developed a new luxury commuter concept; the ‘Cygnet’ which will offer customers a distinctive, intelligent and exclusive solution for urban travel in style and luxury. 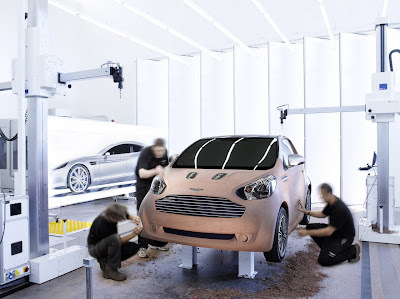 The ‘Cygnet’ concept represents a creative, environmentally conscious solution, being small, yet with presence – and highly fuel efficient, now combined with the prestige of Aston Martin’s luxury brand ownership. 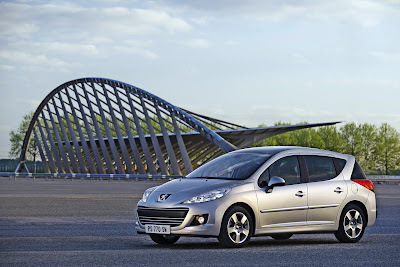 With three body shapes, hatchback, SW and CC, and twelve different power-plant options, the new 207 will further strengthen the 207’s position as Europe’s top selling small car, a position it has held for the last two consecutive years, 2007 and 2008. 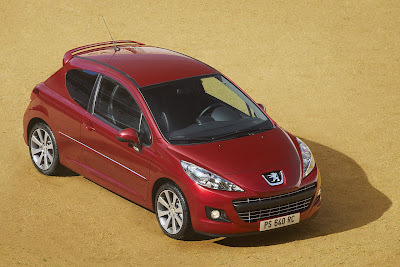 In the UK the 207 is also a big success with over 167,000 vehicles sold since its introduction in June 2006. 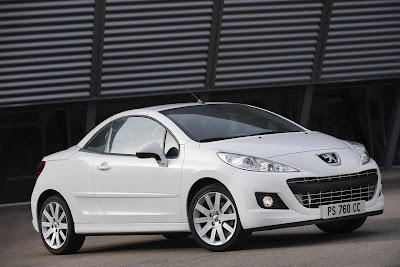 As well as a host of styling changes, the new 207 also benefits from the expertise of Peugeot’s engineers to further reduce fuel consumption and emissions on each new model the marque introduces. Introduction of a gear change indicator on manual gearbox models to encourage the driver to drive in a more environmentally efficient way. 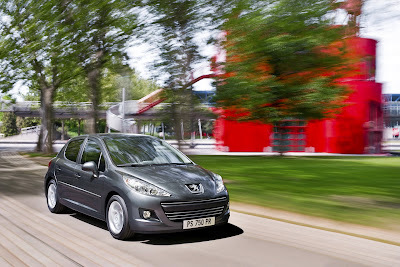 The introduction of the new 207 will also see a range of new standard equipment fitted to the vehicles to enhance both the comfort of all users, the driving experience and the safety capabilities of the vehicle. Remote controlled window closure, via the plip unit on hatchback and SW models. 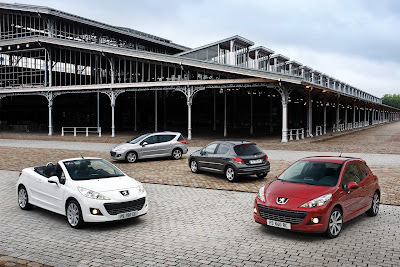 The 207 hatchback, three or five doors: Elegant and user-friendly, dynamic and sporty, it offers a unique blend of comfort and driveability as well as remarkable versatility…. Details of individual model pricing and specification will be communicated in separate releases next month. The Renault Kangoo be bop Z.E. prototype is powered by a 44kW (60hp) electric motor and is equipped with a 15kWh battery. 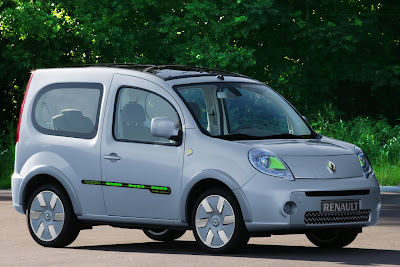 With just 18 months remaining before the release of Renault's forthcoming production electric vehicles, Kangoo be bop Z.E. provides a range of approximately 100km. By the time of their launch, Renault's electric vehicles will have benefited from an evolution to their battery technology which will take their real-world range to 160km. Optimising the range of electric vehicles is a key parameter, which is why Renault is taking all the necessary steps to make this aspect of electric vehicle use as simple and efficient as possible. For many motorists, driving an electric vehicle will be a new experience. The absence of noise from the motor, the immediate availability of peak torque and the linear acceleration curve mean that drivers will need to develop new habits. This has led Renault to give motorists an opportunity to the sample Kangoo be bop Z.E. which previews the brand's forthcoming technology. As a volume car manufacturer and leader in the field of safety, Renault is also doing everything in its power to produce electric vehicles which meet the same exacting standards as the brand's current internal combustion-engined vehicles. The aim is to produce electric vehicles which boast exactly the same advantages delivered by Renault's current line-up, namely comfort, cabin space and safety. Electric vehicles are models in their own right. Electric vehicles are a perfect fit for Renault's eco² environmental stance which seeks to mass market products that have a minimal ecological footprint across their full lifecycle. HOCKENHEIM, Germany : June 29, 2009 -Top times for TECHART at this year’s Tuner Grand Prix at the Hockenheimring race track. 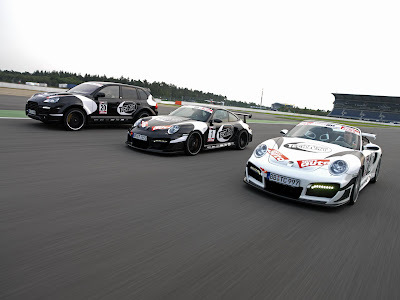 Behind the wheel of the TECHART GTstreet RS based on Porsche 911 GT2, racing driver Jörg Hardt left the competition with no chance and won the duel in the GT Turbo class. This meant that he was able to repeat last year’s victory. The sport auto Tuner Grand Prix is the world’s largest trial of strength in the tuning sector. For the time trial, the TECHART team opted for high-performance Michelin Pilot Sport Cup tires on account of the summer temperatures. Running on the single-piece TECHART Formula GTS light alloy rims in the dimensions 8.5Jx20 at the front and 12Jx20 at the rear, the Michelin tires ensured outstanding grip. The winning driver, Jörg Hardt, who has been racing successfully in motor sports for years, was utterly impressed: “The car had been prepared extremely professionally for the event. The tires performed steady and kept a very high level during the whole competition”. In addition to the victory in the GT Turbo class, Jörg Hardt and the TECHART team also performed exceptionally well in the Coupé / Cabriolet-turbo class. The TECHART GTstreet R Cabrio on the basis of the Porsche 911 Turbo Cabriolet took first place like last year. Achieving a time of 1:09.601, the car had a 3.186 second advantage over its competitors. Jörg Hardt perfected the triumph by coming first in the SUV class. 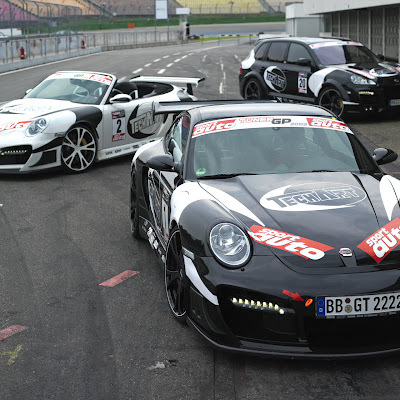 The TECHART Magnum, based on the Porsche Cayenne Turbo S, was entered into the race. 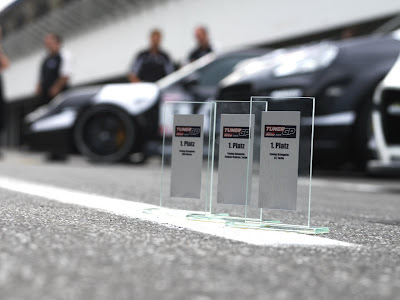 Equipped with the 550 bhp of the production vehicle, an aerokit and sports air suspension module, TECHART achieved the winning time of 1:16.939 for the first time in the heavyweight class. The necessary grip was ensured by the Michelin Diamaris sport tires fitted on 22 inch TECHART Formula rims. “With the victories also racked up this year, TECHART is underscoring its outstanding position in the automotive individualization sector”, says Marc Herdtle, Marketing Director at TECHART Automobildesign GmbH, in recognition of these achievements. the BlueZero E-CELL PLUS with electric drive and additional internal combustion engine as power generator (range extender). This version has an overall range of up to 600 kilometres and can cover a distance of up to 100 kilometres using electric drive alone. The three Mercedes-Benz BlueZero variants are based on the unique sandwich-floor architecture which Mercedes-Benz introduced some ten years ago, initially for the A-Class and then for the B-Class, one of the aims being to integrate alternative drive systems. Advantages of the modified construction include the positive effect of the major drive components on the centre of gravity, their space-saving design and the fact that they are extremely well protected within the vehicle underbody. The five-seater Mercedes-Benz BlueZero concept cars also set standards in terms of lightweight design, interior layout and body form. "The flexible Mercedes-Benz BlueZero concept allows electromobility for every requirement and highlights the fact that Mercedes-Benz is the world's only car manufacturer to already have in place all the key technologies for electric cars offering full everyday practicality", says Dr Dieter Zetsche, Chairman of the Board of Management of Daimler AG and Head of Mercedes-Benz Cars. Interior space is retained in full. As the energy accumulators/generators are integrated into the spacious sandwich floor, no compromises are necessary when it comes to passenger space, luggage capacity or variability. The powertrain technology built into the sandwich floor ensures a low centre of gravity and, consequently, extremely reliable and agile handling. Crash safety is of the extremely high standard associated with Mercedes thanks to the sandwich concept and the housing of major powertrain components between the axles. Leading-edge technology is uniformly and attractively packaged in all three BlueZero variants. The unique and distinctive Mercedes design idiom displayed by the body highlights the progressive nature of Mercedes-Benz BlueZero Concept straight away. The compact rear end of the Mercedes-Benz BlueZero Concept is characterised by tail lights in the shape of a curved "L". In addition, the Mercedes designers have achieved a new-quality light production: transparent lenses produce a red light curtain which tapers smoothly towards the sides, creating a lightly diffused effect. This effect is repeated, albeit in white this time, by the front headlamps. What's more, the front lights feature new lens technology and a plexiglass edge to produce "C" shaped daytime driving lights with the help of state-of-the-art LED technology. "It was very important for us to ensure that the guiding Mercedes-Benz principle of 'Fascination and Responsibility' was clearly reflected in the design of the Mercedes-Benz BlueZero Concept", says Mercedes-Benz design chief Gorden Wagener. "This is yet another clear statement that environmental awareness and driving pleasure will continue to go together in our vehicles in the future. 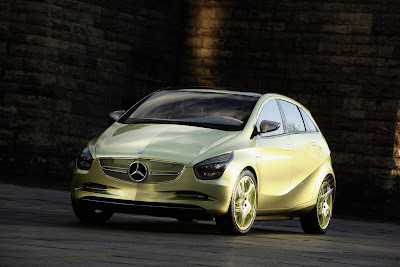 We want people to realise at first sight that the Mercedes-Benz BlueZero Concept is definitively not a lesser option."